Nothing can beat the feeling of wearing a crisp white cotton shirt or catching a nap on a crisp and ironed bedsheet. Also, if you love sewing, cutting a starched fabric can be really satisfying. All of this is achieved by using either a commercial starch or pressing spray that makes the garment or fabric stiff and easy to manage. However, more often than not, commercial starches contain a handful of chemicals that aren’t very friendly when used on natural fabrics. Not only will they shorten the life of your garment, they’ll also come in contact with your skin and pose a threat to your health. 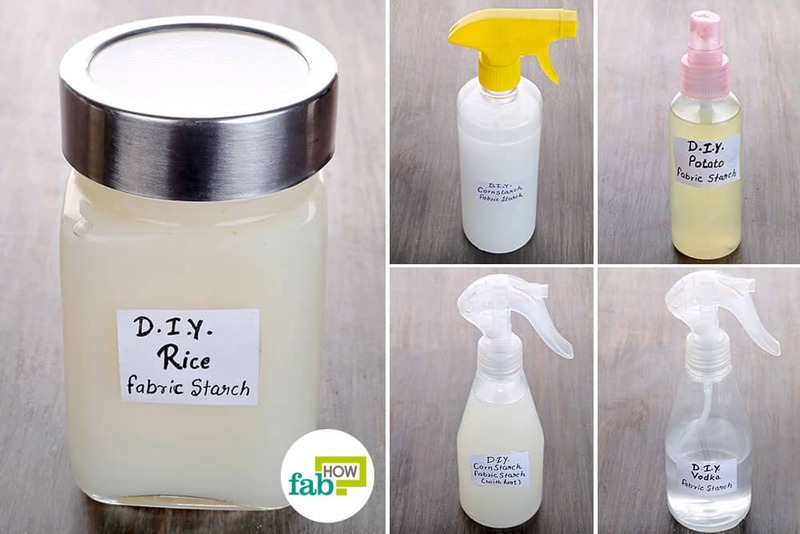 But did you know there are simple alternatives for starching your clothes using household ingredients? 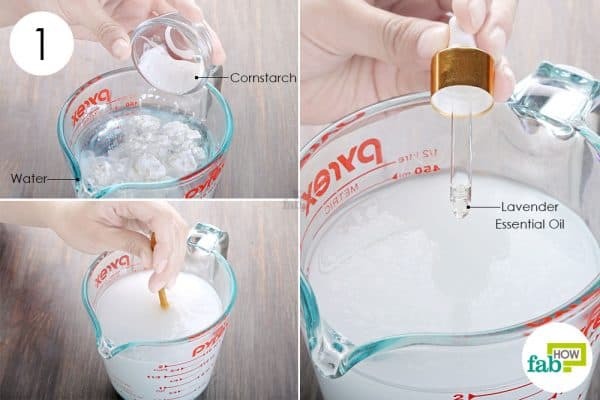 Making your own starch is easy and will help cut down your costs drastically. In fact, if you want to go all natural then you can also learn how to make DIY laundry detergent or how to remove musty odor from clothes. Homemade starch can be made using cornstarch, rice flour, potatoes or other common household ingredients. 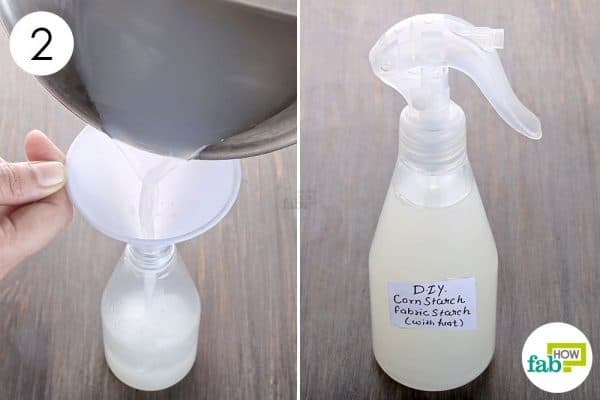 We tried several DIY starch options and bring to you the most effective ways to make and use homemade fabric starch or pressing spray without stepping out of your home. Cornstarch, commonly used as a thickening agent in cooking, can also be employed to stiffen your whites. Cornstarch will also help prolong the life of your fabrics, as it will absorb dirt and sweat. A single wash will clear out the impurities and keep your clothing intact. 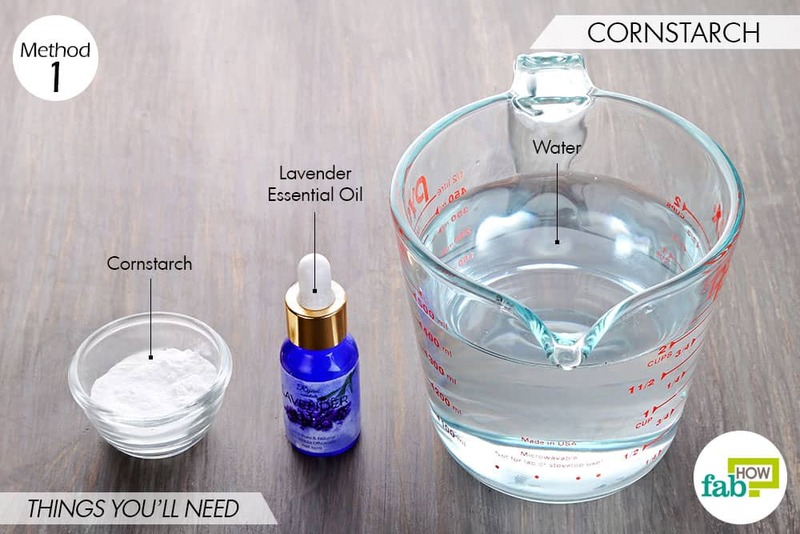 To make and use homemade fabric starch using cornstarch, you can use either of the following methods. One involves boiling the ingredients, while the other can be made instantly. Both cornstarch sprays will stay good for a couple of weeks. However, do check before using it. Discard it if it is giving off a funky smell or developing mold. Note: If you have a hard water supply, use distilled water. Put 1 tablespoon of cornstarch in 2 cups of water. Stir well to blend in the cornstarch. Add 1 or 2 drops of lavender essential oil to add fragrance. You can use any other essential oil of your choice as well. Also, you can increase the quantity of cornstarch to get more stiffness or add water for less stiffening. Transfer the prepared solution to a clean spray bottle. Spray the solution all over the fabric. The clothing should be damp but not dripping wet. Hang the clothing to let it dry completely. If you need it immediately, simply iron it on medium heat to make it crisp. Add ½ tablespoon of cornstarch. Stir well and cook it on high heat until it comes to a boil. Let it simmer for 1 minute, then turn off the heat. Use it as described in Method 1, Step 2. 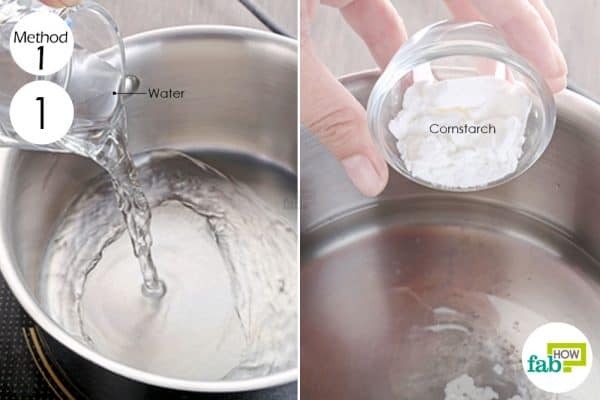 You need not shake this homemade starch before every use, as the cooked cornstarch will stay suspended in the water. In a pinch, white glue can be used as a fabric stiffener. While not completely safe, it is a better option than using a commercial starch. The glue-based starch will dry as a clear film that can be easily washed off with warm water and soap. 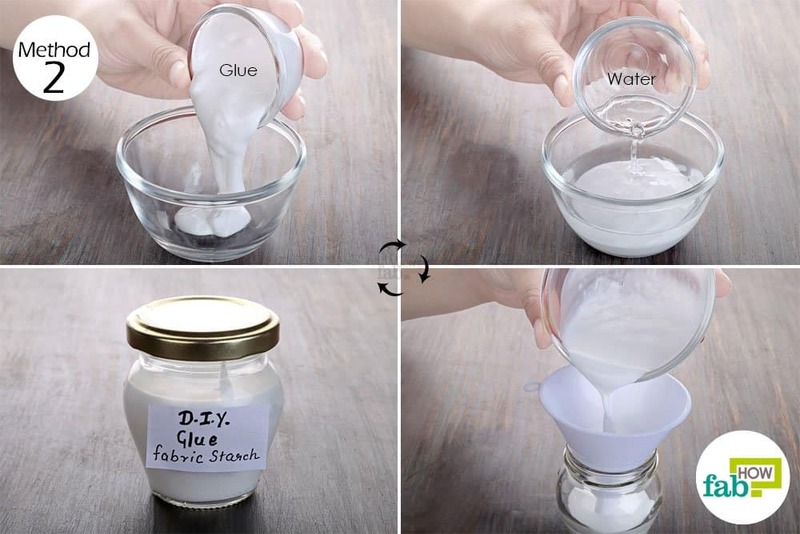 Pour 2 tablespoons of white glue into a bowl. Add 2 tablespoons of water. You’ll be dipping the clothing in it, so prepare a bigger batch for large clothing or fabric. Mix the ingredients well. You can also alter the consistency by adding more glue or water according to the stiffness you need. Dip the clothing in the solution. Wring out the excess liquid and hang the clothing until it dries completely. Potatoes are essentially made up of starch, which can be extracted and used to make your linens crisp. 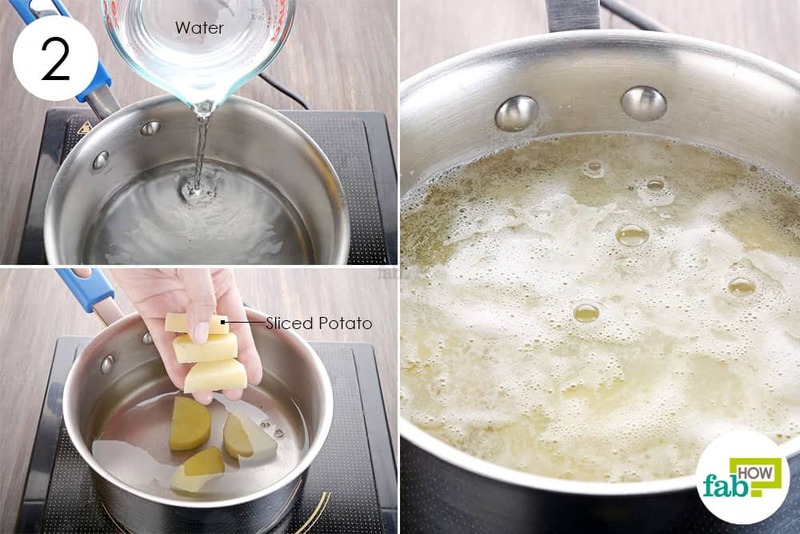 All you need to do is blanch peeled potatoes in hot water. The starch granules in the potatoes will absorb water and burst, releasing the starch into the water. 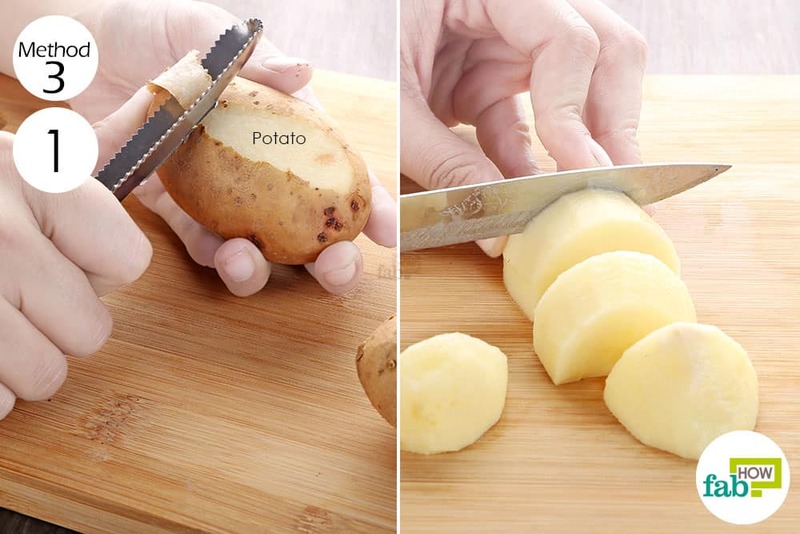 Peel off the skin of 3 to 4 big potatoes. Cut them into medium-sized pieces. Pour 2 cups of water in a medium-sized pan. Add the potato chunks to the water. Bring the water to a boil, then let it simmer for 1 to 2 minutes before turning off the heat. Let the potatoes sit for a few minutes to release the starch into the water. Strain the liquid into a bowl and let it rest for 10 minutes. This will allow the starch particles to settle at the base of the bowl. Funnel only the clear liquid into a spray bottle and discard the sediment. Simply spray the liquid on the garment you want to stiffen, then iron it. Using rice water is a traditional way of starching clothes. 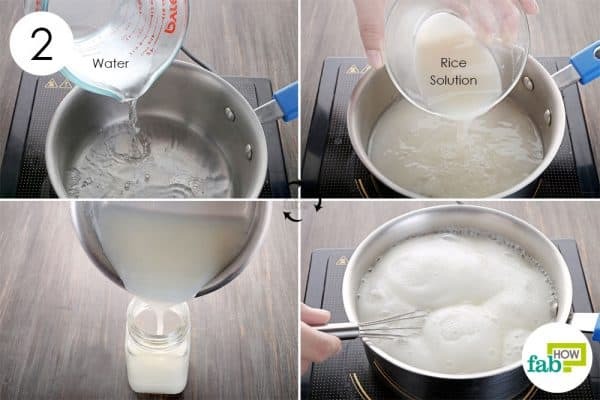 You can boil the glutinous rice and separate the cloudy water from it to use as starch. 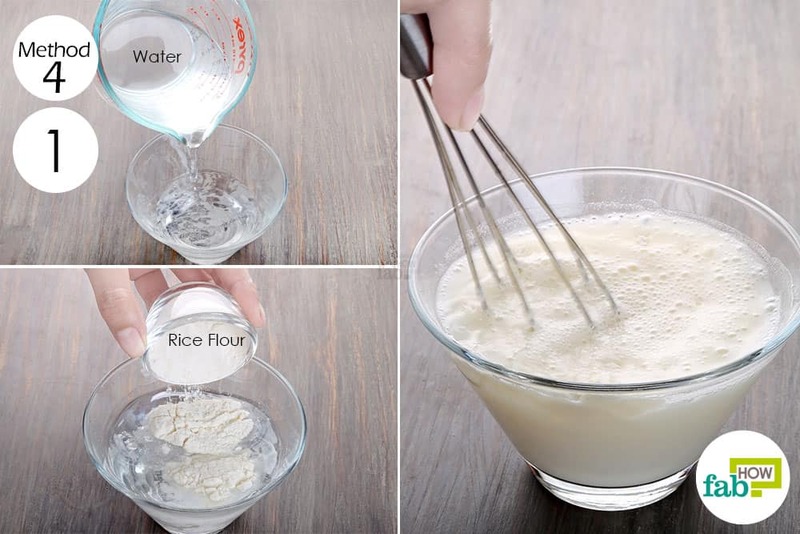 While this is the old-school way of using rice water, you end up throwing away the rice if you don’t want to eat it. 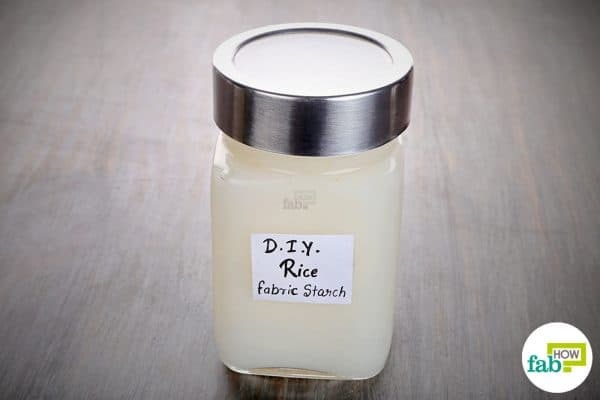 To avoid waste, you can simply dissolve rice powder in water using the following instructions and starch your clothes with it. Add 5 teaspoons of rice powder. Whisk vigorously until you get a lump-free solution. Bring it to a boil, then add the rice solution to it. Continuously whisk the liquid in the saucepan over high heat until you get a lump-free, translucent liquid. 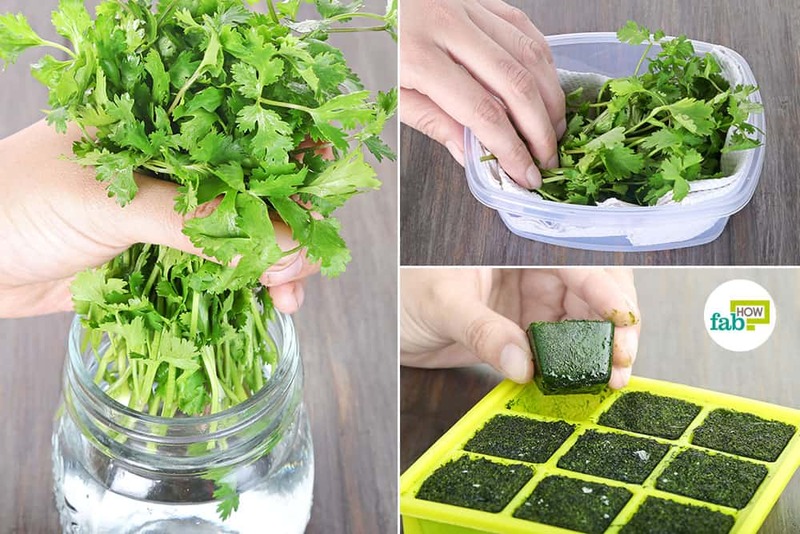 Allow the liquid to cool down completely, then transfer it to a jar for storage. 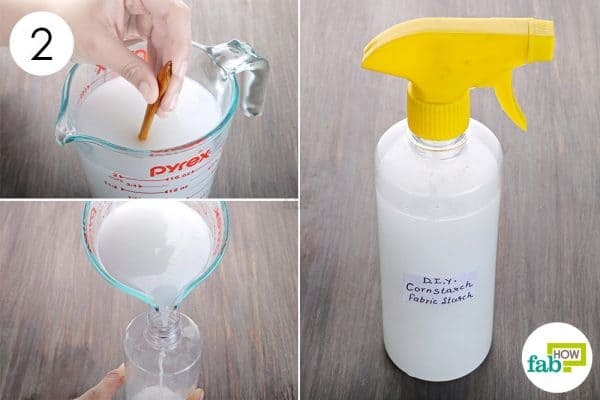 To use, add some of the solution to warm water and soak your clothing in it. The quantity you’ll need to add depends on the stiffness you wish to achieve. Vodka is also quite handy if you plan to make and use homemade fabric starch, especially for dark-colored clothes as it does not leave any residue. While it won’t be as effective as the other homemade starches, it should freshen up your garments by making them iron crisp. 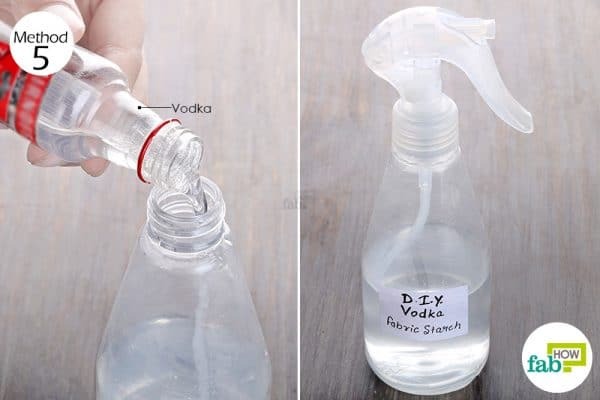 Pour ½ cup of water into a spray bottle. Add 1 tablespoons of vodka. Put the nozzle on and spray the solution all over the garment. Iron the clothing to make it crisp. 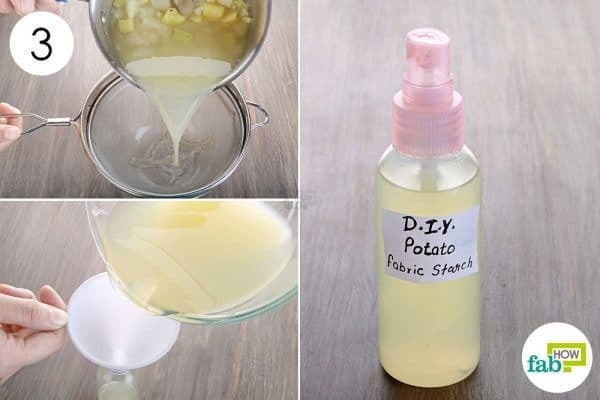 If you’re adding essential oils to your homemade starch, don’t use more than 1 or 2 drops. White flour can also be used instead of rice powder to starch white linens. However, it will give the fabric an ebony white appearance instead of bright white. Always do a patch test on a spare cloth before using your homemade starch on your clothing. This way you can assess the crispness and alter the quantities to get the desired results. You can check out more DIY laundry hacks here.